The 2008 Suzuki GSX-R1000 is here and it's ready to ride! The GSX-R1000, also known as the Gixxer, is a legend in the Suzuki lineup. Year after year the Gixxer ranks near the top with the best performing motorcycles in its class. Boasting a 999CC, four-stroke, four-cylinder engine, the GSX-R1000 is ready for the street or track right out of the box! The engine is liquid cooled with dual overhead cams and 16 valves, helping to increase the power of this beast. Suzuki features their Suzuki Dual Throttle Valve system(SDTV) on this model to aid in the fuel-injection, making their fuel system compact and efficient. 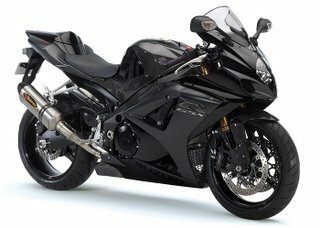 The 2008 Gixxer sounds great in part from the Suzuki Advanced Exhaust System(SAES), featuring aluminum/titanium mufflers located on both sides of the bike, with pipes of equal length that run under the engine. With Suzuki you would expect a cutting-edge chassis, and they deliver in spades! The five-casting, twin-spar frame, is lightweight and durable, offering flawless performance! 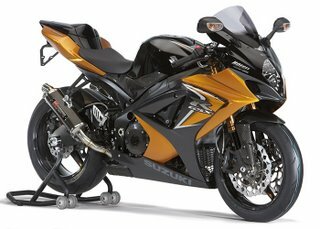 Suzuki also boasts a rigid aluminum-alloy swingarm that pivots for better traction and performance. The front suspension is race-ready with an inverted telescopic design, featuring coil springs, and is fully adjustable. The rear suspension is a link-type, gas/oil set-up. The 2008 model is available in Blue/White, Black/Gold, and White/Silver. The Suzuki Hayabusa is the flagship motorcycle of this company, but the GSX-R1000 is an ample and nasty little brother to it. In typical Suzuki fashion, the GSX-R1000's acceleration is swift and the handling is track-ready. If you're looking for a motorcycle with speed and performance, this model might be perfect for you! Visit http://www.verticalriders.com for fast motorcycles and motorcycle videos.